So today marks one ENTIRE year of this website being live on the internet and yes I did buy myself a cake. 365 days of Black Tulip Beauty. I can’t quite believe it. This intro is going to be short and sweet as this post is not. 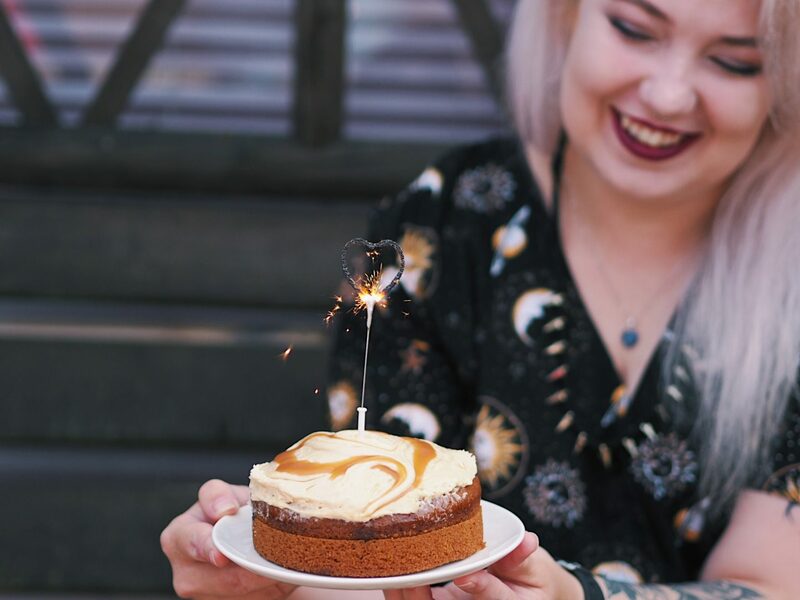 You may have noticed my site has had a complete makeover and I am unbelievably happy with it! A huge thank you to Pipdig for all the help and the incredible theme that I have customised and tweaked to the high heavens to my liking! Let me know what you think of it and let’s dive right in. A month or so ago I realised I was relatively close to this milestone and you bet I wanted to hit it before the big day came. I’m so pleased to say that I hit 25,000 views on my blog on the 8th August! I know it’s not the hugest number but we all grow at our own pace and most months I have exceeded the one before in views and interaction. Blogging obviously isn’t at all about those things but my god is it good to know that people actually want to read and engage with your content. I’ve been a brand ambassador for Bomb Cosmetics for around a year now. They were (and still are) one of my favourite brands so essentially becoming a part of their promotional team was a dream come true. They were the second brand that I set up a collaboration with and still to this day are my absolute favourite to work with. 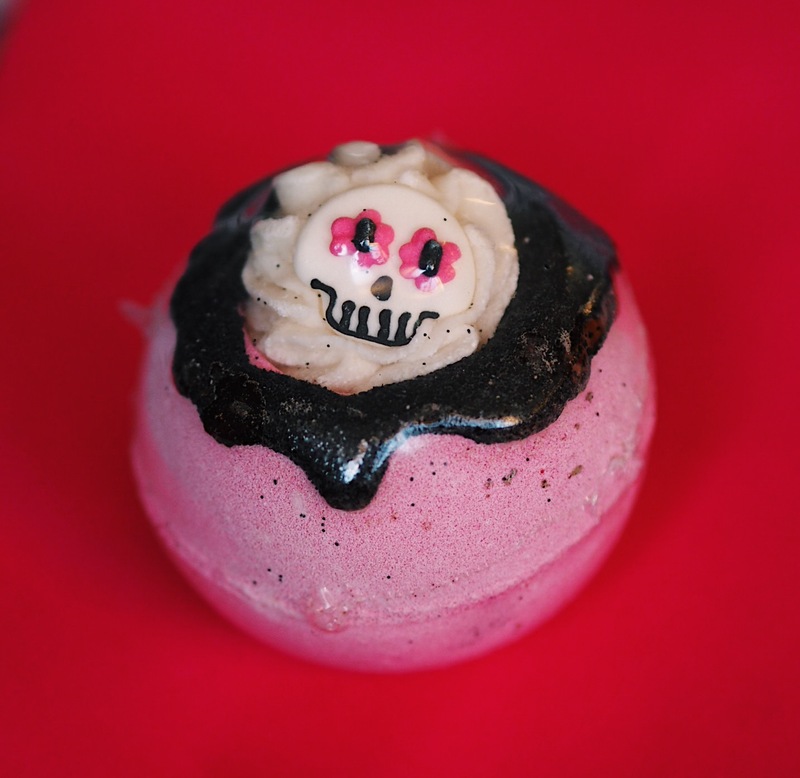 I also won a competition with them last year to have my own creepy bath bomb design made and sold for Halloween. I did write a whole blog post on it but when updating my site at some point, it got wiped and I have never been able to get it back unfortunately. If you weren’t around when this happened, here is my design “Dead Cute”. Its scent is chocolate raspberry and I really hope they bring it back some day! I don’t mean to toot my own trumpet but my progression in this area has been quite incredible. I know I’ve still got quite a way to go but the difference between my photos in a year is crazy. Admittedly, upgrading equipment has really helped but I’ve also put a lot of time and effort into practicing and finding ways to improve my work. It’s really paid off as over the last few months especially I’ve received so many compliments about my photographs! Like with the views, this isn’t what blogging is about but for once in my life I actually feel like I deserve these opportunities. I work incredibly hard on my blog and to have brands and businesses noticing it and wanting to advertise theirselves through me is amazing! Don’t get me wrong, they haven’t been all sunshine and rainbows. There have also been far too many occasions where I’ve had to turn down opportunities due to follow links, the products not being suitable for my audience, underpayment and a whole load of other issues. I’m also proud to say that I’ve sent back products I haven’t felt inspired to write about and I’ve declined collaborations on arrival of products due to bad quality or the fact I wouldn’t personally wear them. My blog is a place for me and I wouldn’t promote something I didn’t think was worth the money or that I wouldn’t actually use/wear. I’m also learning more every day not to undersell myself and how valuable my work is! I’ve honestly spent the majority of my life being a bit different and feeling super out of place. I’ve been bullied and still get looked down on for it at times, which obviously doesn’t make me feel the best about myself. Life also decided to give me a pretty awful autoimmune disease, as if I needed anything else to make me feel different. Coming into the blogging world was scary, sharing more about myself online was even scarier because of this reason. I know there are probably people close to me reading this thinking, “what on earth are you talking about, I love how different you are” but for every person who loves my differences, there has been someone who isn’t so fond of them. Funnily enough, the blogging community has been more accepting of me than any other place I’ve been. I’ve always been much more creative than academic and I’ve had more hobbies than you could count on your hands. This blog has given me a means to channel the majority of that creativity into something quite amazing. I never believed I was talented enough to make a career out of my creativity until this blog has showed me I could if I set my mind to it. Starting up Black Tulip Beauty and the support I’ve received has given me so much more belief and confidence in myself personally aswell as professionally. My writing may not be the most eloquent and I may not have the widest vocabulary but I think people come to my blog because it’s relatable and easily readable, which is far more important in my eyes. Blogging has made me fall in love with creating again and I’d happily do this every day for the rest of my life. I’m a super organised person but I don’t usually like setting solid goals as otherwise I get really upset and demotivated if I don’t hit them. I’m just going to say they’re aims as that’s a less serious word, right…? I actually don’t think there is. I’ve seen a lot of people in the Blogosphere progress a lot quicker than I have or that have a lot more connections but I think sometimes that take on things can make you burn out just as quick, too. I’ve always stayed out of the drama and had my own style that’s a bit different from the normal whitewashed blogs (which are super beautiful, just not very me). I’m really happy with where I am currently and If I did anything differently it’s unlikely I’d be right here! A lot of things to be honest. I think the thing I’ve struggled with the most is having to constantly be on the ball with social media and promoting my content. Sometimes I really just want to switch off but it’s like with any business, you have to be putting it out there for people to see it. Even when I do have a break, I’m still thinking about content and ideas etc or feeling guilty about not working on it, it’s a bug! Just always be yourself. There’s no use copying other people or trying to be someone you’re not. It will eventually show through in your content and writing that it’s not from a genuine and passionate place. There’s always going to be people out there who find you intriguing and want to read your content. It might not be the most popular or the best on the market but if you’re starting your blog for popularity then maybe you need to re-evaluate anyway. Just upload what YOU want to. 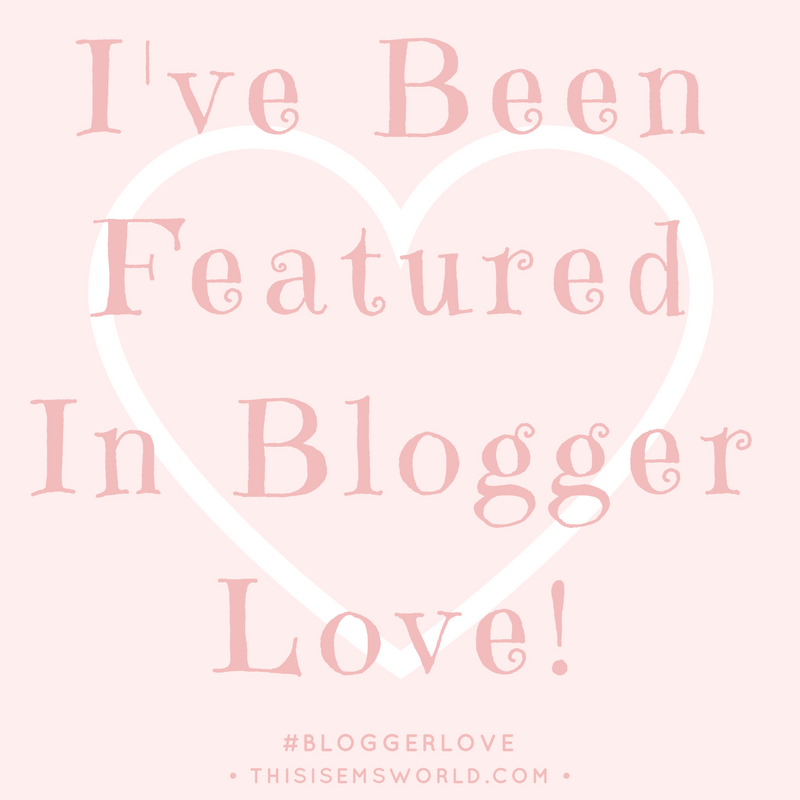 I’ve also been featured in a series called “Blogger Love” that went live today over on Em’s World. 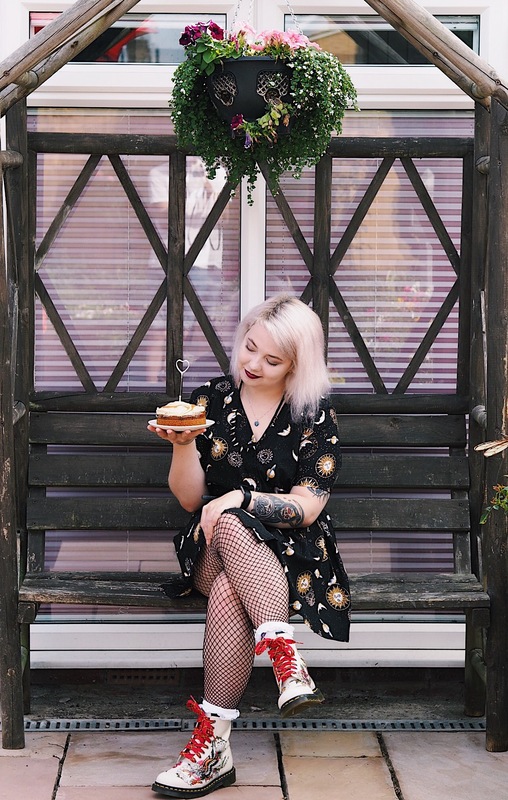 Go check out the post here if you want to know a little more about me and my blog and please give Em’s blog some love whilst you’re at it. If you want to get involved in the series as a blogger, you can pop her an e-mail which you can find on the site to get yourself featured, too! Now this blog wouldn’t be half as fabulous as it is without some people that have helped me. I mean the first thanks has to go to anyone that has clicked on, read, shared, commented, liked or interacted with my blog or posts in any way! Also a huge thank you to any one I’ve made friends with in the blogosphere, I surprisingly have quite a lot of them and if I named them all I’d be here forever. I appreciate your support more than anything and I’m so excited to hopefully meet you all one day at events or meet-ups! 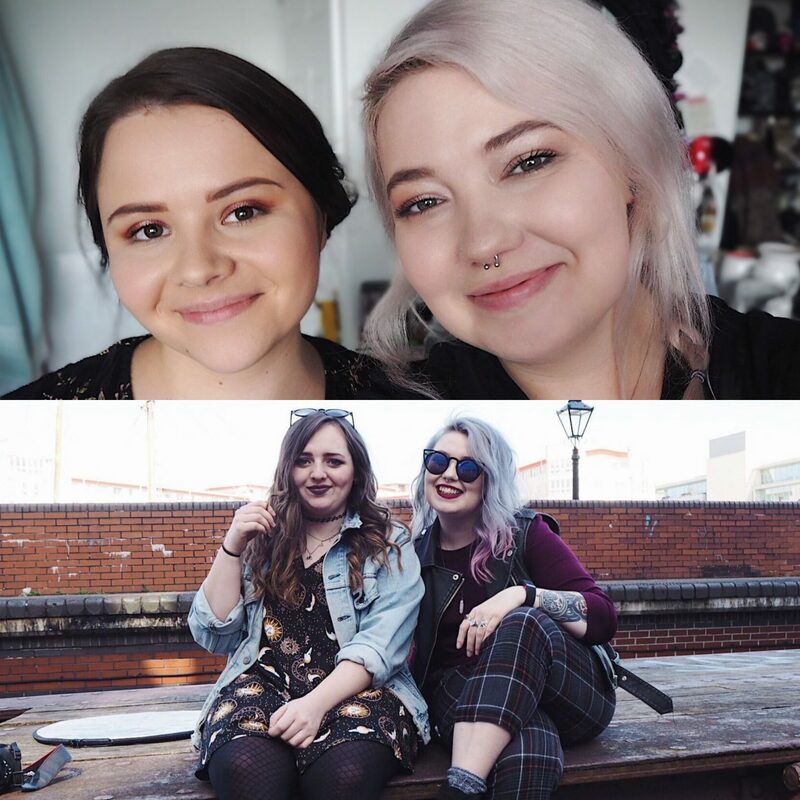 I do have to give a special thank you to Alice Hobbis and Becky Lane though, I feel so blessed to have found such fabulous friends through blogging and I hope we have many more days of nugget eating and complaining about getting out of bed to come. A special thanks to any of my friends and family that have also supported me, especially my mum as she always gives my posts a read and an occasional comment. Which reminds me I definitely need to introduce you guys to more of my actual friends as right now, I look like a bit of a loner on here. A special thanks to Jake for helping me with literally every aspect of blogging – photographs, writing, coming up with post titles, not getting mad when he has to sit and watch friends/play with my hair whilst I’m furiously typing away, again. Selflessly buying products for me to review when I have £3 to my name. Celebrating my successes with me and also being the greatest support when things don’t turn out the way I wanted them to. 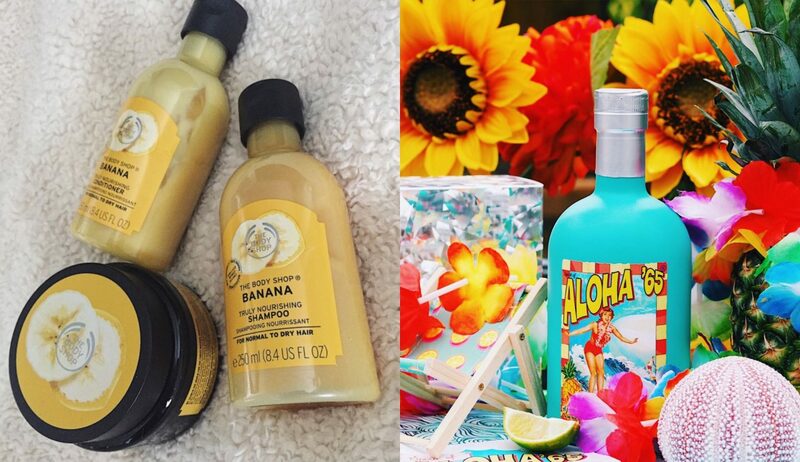 I’ve also discovered recently that he’s a dab hand at flatlays (I’m still taking the credit for them though, sorry…). 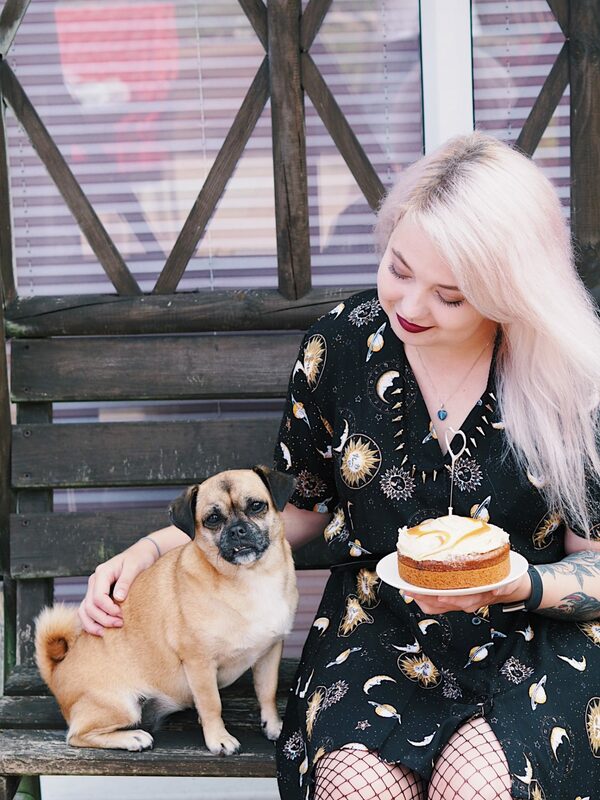 Last but not least, thank you to Nacho my little furry friend for providing the best cuddles, encouraging licks/boops, motivating me to take her out for walks when I get too swallowed up by blog work and just being the best and cutest dog ever. On an ending note, Black Tulip Beauty has made me SO happy. Thanks for being here and I just know the best is yet to come. Hit that subscribe button if you haven’t yet! "10 Small & Simple Ways To Improve Your Life!" Aww thank you for such a lovely comment! Bristols a fab place to live ☺️ it really is hard work, people don’t realise! But yes it is a great way to express creativity, I love it so much! This is such a lovely positive post and happy 1 year! Thank you Ellie ☺️❤️ it’s been a great year! Happy blogiversary, love! Some amazing accomplishments in such a short time! Thank you so much ☺️ I’m super proud of myself! Congrats on your first year! such a big milestone! 25k views is amazing, well done! and so many amazing collab! i’m sure you’ll do even better on your second year! Congratulations and happy birthday to Black Tulip Beauty!! I can’t wait to see what the next year brings you. I hope you smash all your goals and more. CONGRATS ON ONE YEAR! You’ve done an absolutely amazing job and I can’t WAIT to see where that leads you next year! This was such a sweet post and I agree – it can be harder to grow when you’re not the typical whitewashed blog and that can be a bit disheartening sometimes. However, you’ve done a brilliant job, keep going girl! Thank you ☺️❤️ so glad you enjoyed it! You’re website is absolutely adorable. I love it!! 25,000 is HUGE!! Can’t wait until I’m at that level! congratulations! yeah growing is that much harder when you dont fit the “mould” of what everyones think you have, but you show you can do it! First off congratulations on a year of blogging, and this new site design is gorgeous!! You’ve done such an amazing job in this year, it’s such a sweet post to read all your achievements and goals for the future of your site. I hope you achieve them all and your health improves to make them all possible. I’m so happy for you and the growth you’ve made despite not being a typical white washed blog. You’re such an inspiration and you’ve done brilliantly so far, keep going!! Aw happy one year, I love this post! You’ve had a great first year and I’ve loved so much of your content so can’t wait to see what you have planned for the future! I completely relate to blogging increasing confidence and it’s done the same for me too! Congratulations on reaching this very exciting milestone! It looks like your blog has progressed so well, and your photography skills are so good now! I’m still working on mine 😀 I’m looking forward to reading more of your blog! MAJOR CONGRATS on hitting 1 year with Black Tulip Beauty! It’s great that you’ve been blogging for this long – I thought you’ve been blogging longer. This shows how good you are at kicking off the blog to such a success. I love that you have a custom bath bomb – fits your style! I like that you’ve been getting better with your photography as time goes by. Hey, don’t worry about tooting your own horn. You deserve the bragging rights. I’m glad that you’ve learned so much and it’s been great reading your blog! Sending you lots of positive vibes for your journey to year 2! Congratulations on this milestone! 🎉🎊🎉🎊🎉🎊🎉🎊 Seeing all the things you’ve accomplished just left me feeling, “Wow!” You go, girl! Happy Birthday and congratulations!! You have done so, so much in a year, you should feel so proud! You’ve built this beautiful blog from an idea and look what you were able to do. I’m so glad I discovered your blog, and I’m so excited to see what the next year brings.